Loading and Maintenance Dose: We recommend an initial loading dose of 4 capsules per day for the first two weeks. After two weeks you can switch to a maintenance dosage of 2 capsules per day. How to Take: The timing of the dose does not matter as long as the recommended amount is taken per day. Generally, the best time is prior to or directly with a meal with a glass of water. More Information: There are many fish-oils on the market, but only Omax3 contains the revolutionary 4:1 ratio of EPA to DHA, which Yale-affiliated research has shown to better resolve inflammation than any other combination of EPA and DHA. Omax3 Ultra-Pure delivers more than 97% pure omega-3 content and greater value. 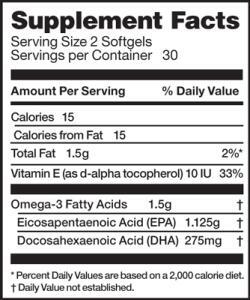 Some supplements may contain more than omega-3. And some of that “extra” content you could do without, such as saturated fats, including unwanted omega-6 fatty acids, and toxins like mercury, lead, and PCBs commonly found in fish. Omax3 Ultra-Pure attains exceptional purity through a double distillation process that eliminates these additional substances. All batches are 3rd party tested twice for quality assurance. Omega-3 products stored in bottles are exposed to air, turning them rancid and causing upset-stomach and fishy burps. Omax3 capsules are sealed in pharmaceutical-grade blister-packs, ensuring freshness in each dose. Not all omega-3 supplements are created equally. 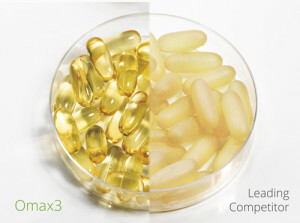 Omax3, the Ultra Pure Omega-3, delivers 1.5 grams of nearly 100% pure omega-3 in a proprietary 4:1 EPA to DHA blend. Our blend has distinct advantages above and beyond normal omega-3 supplements. Omax3 is 100% sourced from Peruvian Anchovies and Sardines. Wild caught in sustainably-fished waters, these oily fish live at the surface away from land and provide the worlds best source of omega-3. Do I get enough omega-3s from my diet? Probably not. Two omega-3 essential fatty acids called EPA and DHA are found in fish and have been shown to promote a healthy heart. According to a study by the Agency for Healthcare Research and Quality, only 25% of the US population gets any EPA or DHA from their daily diet.